Sowdering About: What did I do Saturday? What did I do Saturday? Does everyone have their hands out? Well put one finger in the air because that is exactly how many friends I have out here. I am in the process of meeting new people, I am becoming friends with our neighbors, I joined a mom's group out here so that I can take the kids to play groups, but moving up here I knew two people, Matt's best friend, and another lady that I met on the internet on a pregnancy board almost 5 years ago. That is it. Saturday, my one friend, asked if I would be interested in going to a painting class with her. 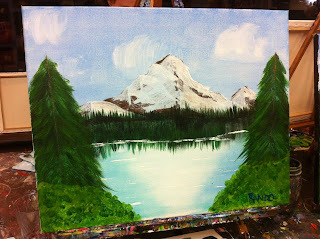 It was "Bob Ross" night. Um, what other answer would their be? Listen here internet, if anyone ever asks you if you want to go to Bob Ross night, you say yes. Always. So this place we went to, Palettes and Paintings, is a pretty cool place! They serve wine (win) and teach you how to paint (win win) and it's seriously a lot of fun too (win win win). Ok, so you don't leave there being a perfect artist, but what I learned was pretty cool. I also don't think I have ever been as proud of a project as the painting that I did on Saturday night. I seriously cannot stop looking at it thinking "wow, I DID that!" I really cannot wait to go again, I am hoping sooner than later. It was also nice to have a night out sans kids. He learned to paint in Alaska. Oh and did you want to see my painting? Yea, I did that. I do hope you meet tons of cool people out here but I'm glad to be your 1 friend!!!! I had a load of fun too and TOO, cannot stop gazing at my painting :) you choose the next painting and I'm there!!!! Hi there! Found this post on the PP Facebook page - I love this place, too. Wanted to say welcome to the area and make sure you know about Macaroni Kid ... hyper-local, kid-friendly event listings. Published by two local moms, we are a great resource for parents getting to know our community! There are also Eastside and South Sound Macaroni Kid sites.